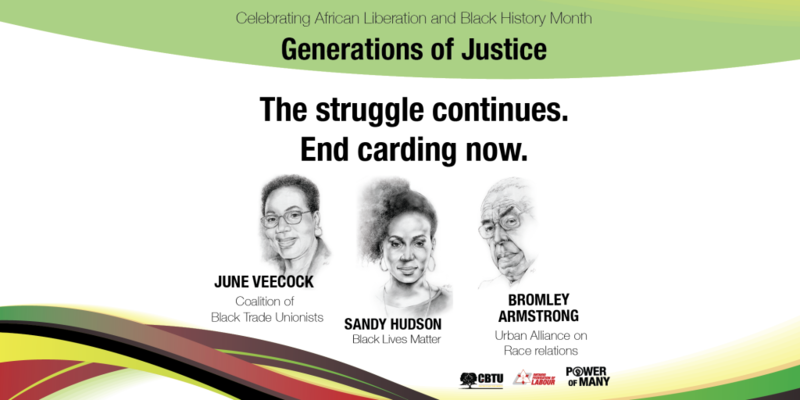 The Coalition of Black Trade Unionists Canada and the Ontario Federation of Labour are celebrating African Liberation and Black History Month by launching a new series: Legacies of Labour and Community Activism. The Legacies series honours the historical achievements of African Canadians and features the ongoing contributions of activists in the Black community. 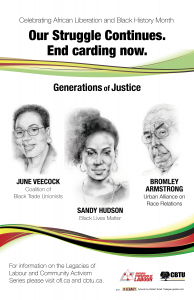 Generations of justice activists like June Veecock (Coalition of Black Trade Unionists) Sandy Hudson (Black Lives Matter) and Bromley Armstrong (Urban Alliance on Race Relations) are recognized for their unwavering commitment to end anti-Black racism, Islamophobia, and racial inequality in all its forms. Their struggle to end racist policies continues today. In downtown Toronto, a Black man is 17 times more likely to be pulled over for a police street check than a white man. Racialized women earn 58 cents for every dollar earned by white men, a gap that has only been reduced by 5 cents since 2006. Our struggle for justice continues. The OFL and CBTU call on the government of Ontario to immediately stop the discriminatory practice of carding and to enact legislation to end racist pay practices. This African Liberation and Black History Month, and every month – we must all commit to continuing our work toward Black liberation, social justice, and equality for all. Sign the petition demanding the government end carding now. Click here to sign. Download a petition for your workplace. Click here to download. This year’s poster in the Legacies of Labour and Community Activism series honours Bromley Armstrong, June Veecock, and Sandy Hudson. Sandy Hudson is a Toronto-based organizer, communications specialist, political strategist, public intellectual, writer and abolition activist. She is the founder of the Black Lives Matter movement presence in Canada and Black Lives Matter – Toronto. She also co-founded the Black Liberation Collective – Canada, the campus-based extension of the movement. The work Sandy has accomplished with her team has been formidable, and her efforts to publicly address anti-Black racism have resulted in concrete policy change, including the winding down of the program that places police officers in the largest school board in North America. Born in Toronto to two Jamaican migrants, Sandy has always had a passion for community service, beginning her activism in anti-war, education and feminist movements. Sandy works as an editor for a social justice blog at Kalamazoo College and a Staff Representative for the Canadian Union of Public Employees and is a proud member of the Coalition of Black Trade Unionists. Sandy holds an MA in Social Justice Education and her academic work is published in New Framings on Anti-Racism, Vol. II and the second edition of Race and Racializations. Sandy credits her accomplishments to her parents who raised her with a strong moral compass, the elders who came before her, and the team of inspiring people she is blessed to work with. In 1948, Bromley Armstrong was working at Massey Harris, and decided to take welders training, but when he applied for work his application had been “lost.” The company had never hired a Black welder. He turned to the UAW, which at the time had 4500 members, only 13 of them Black. He was told ‘you are part of this movement,’ sparking his lifelong commitment to labour. Armstrong’s accomplishments are many. From 1973 to 1997, he published a newspaper called “The Islander,” served on the Ontario Human Rights Commission, and as an adjudicator with the Ontario Labour Relations Board. He successfully lobbied North York Mayor Mel Lastman to create a municipal race-relations committee, and was on the Board of Governors for the Canadian Centre for Police Relations. Armstrong was a recipient of the 1994 Order of Canada, and the Order of Ontario. In 2004, the Toronto and York Region Labour Council established an annual award in Armstrong’s name to commemorate his courage, dedication and outstanding service to the labour and human rights movements in Canada. June Veecock, an anti-racism activist and Human Rights advocate, was the first woman from a racialized community to work for a central labour organization in a senior position when she became Director of Human Rights for the Ontario Federation of Labour in 1986. As Director of Human Rights she was responsible for the Ontario Federation of Labour’s Anti-racism and Equity programs. June was a founding member and Chair of the Ontario Coalition of Black Trade Unionists and a committed member of the Congress of Black Women of Canada. Veecock championed the case of a group of Black and Visible Minority nurses which brought the first successful case of systemic discrimination on the grounds of race to the Ontario Human Rights Commission in 1994.